COE helps users leverage their investment through education, training, networking, product influence and best practices. have direct access to influence the future of Dassault Systèmes solutions. COE members work across multiple industries and use a variety of solutions - not just CATIA, anymore - making members' experiences that much more diverse and valuable. The COE logo serves as a reminder of what makes up our unique community. The 'O' in COE is made up of three pieces, each representing a pillar of the organization. These pillars are a commitment to our members. 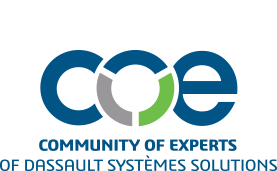 COE has, and will continue to be the leading Dassault Systèmes user group and the place to go for professional advancement.